SpaceX's Crew Dragon capsule sits next to a Falcon 9 rocket in a hangar at Launch Complex 39A at NASA's Kennedy Space Center in Florida. The capsule is scheduled to launch on its first demonstration mission, an uncrewed trip to the International Space Station, on Jan. 17, 2019. SpaceX's astronaut taxi is getting ready for its first-ever trip to orbit, with the mission less than a month away. SpaceX just released two new photos of a completed Crew Dragon capsule inside a hangar at Launch Complex 39A, part of NASA's Kennedy Space Center in Florida. One of the images also shows the Falcon 9 rocket that will loft the Crew Dragon on its debut flight, which is currently targeted for Jan. 17. On that uncrewed mission, known as Demo-1, the reusable capsule will visit the International Space Station (ISS) for a few weeks and then make a parachute-aided splashdown back here on Earth. The goal is to prove out Crew Dragon's abilities before putting astronauts aboard for an ISS trip, which could happen as early as June if everything goes well. SpaceX holds a multibillion-dollar NASA contract to ferry astronauts to and from the ISS using Crew Dragon and the Falcon 9. Boeing also signed such a deal and will fulfill it using United Launch Alliance Atlas V rockets and a capsule called the CST-100 Starliner. Boeing's first uncrewed demonstration flight to the ISS is currently scheduled for March 2019. When these two private capsules come online, they'll end NASA's dependence on Russian Soyuz rockets and spacecraft for crewed ISS missions. Russian vehicles have been the only orbital option for astronauts since NASA retired its space shuttle fleet, in July 2011. 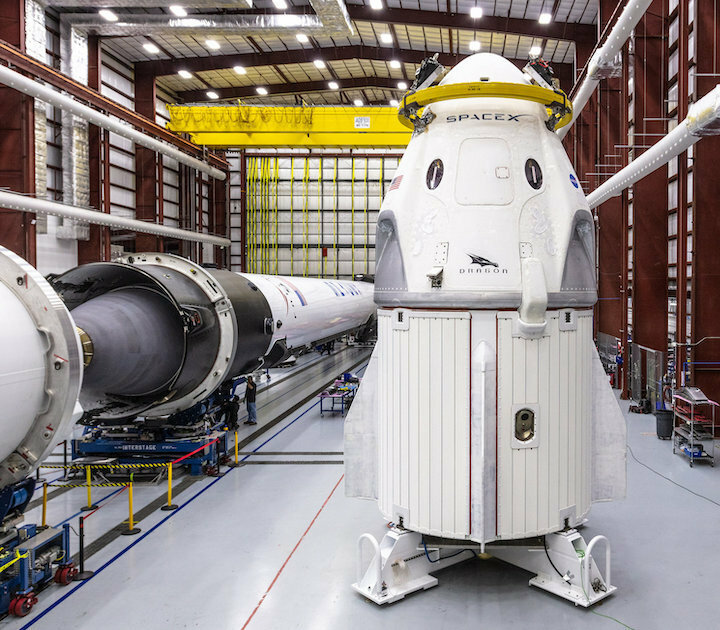 Crew Dragon is an upgraded cousin of SpaceX's robotic Dragon resupply capsule, which has been making cargo runs to the ISS for NASA under a separate contract since 2010. Another look at the Crew Dragon at Pad 39A. Like many spacecraft, the cargo Dragon relies on solar panels that deploy after the vehicle reaches space. 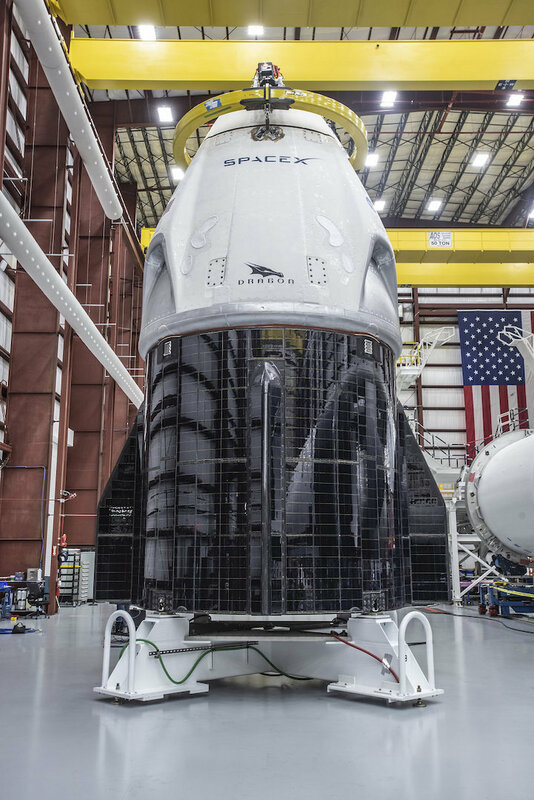 Crew Dragon, however, has solar panels built into its trunk, as one of the newly released photos shows. The Dragon vessel also features many other amenities that the cargo craft lacks: seats, for example, and interior touch-screen displays. Vice President Mike Pence was impressed by the Crew Dragon, which he saw up close yesterday (Dec. 18) during a tour of Kennedy Space Center. "Incredible opportunity to see @SpaceX's Dragon 2 Capsule — an important part of the future of American human space exploration as we aim to return American astronauts to space on U.S. rockets from U.S. soil!" Pence said via Twitter yesterday.